I love making meatballs, because they are soft, juicy and a great appetizer for parties. For a while, I haven't baked a casserole dish and I felt the urge of reexperiencing the taste of a baked pasta with the cheese melted on top. 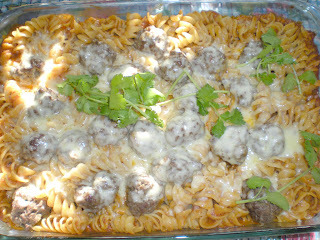 A cheesy pasta meatball casserole is what was needed, a real comfort food at its best. 1. In a small skillet, heat oil over medium-high heat. Cook onion until transparent. 2. In a medium bowl, combine beef, egg, onion, bread crumbs, garlic, salt and pepper. Shape meatballs about 1'' in size. 3. In the same skillet, heat oil over medium-high heat. Cook meatballs until all browned, about 20 mins. Set aside. 6. Transfer pasta into a 13''x9'' baking pan and combine with the spaghetti sauce. 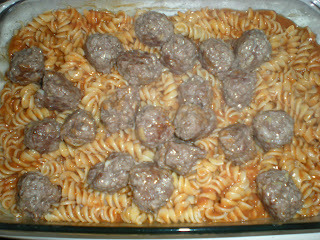 Scatter meatballs into the pasta. 7. Cover and bake for 45 mins until hot. Turn heat off, remove from oven and top with mozzarella cheese. Return to oven, uncover and cook until melted, about 3 mins. Serve. We usually don't have meatballs around here, because my boyfriend was apparently traumatized by them during his childhood - so I tend to use "unballed" ground meat in recipes (because apparently, that's ok). But this certainly looks comforting!